St Helen’s Well, Eshton, North Yorkshire. SD 9309 5704. 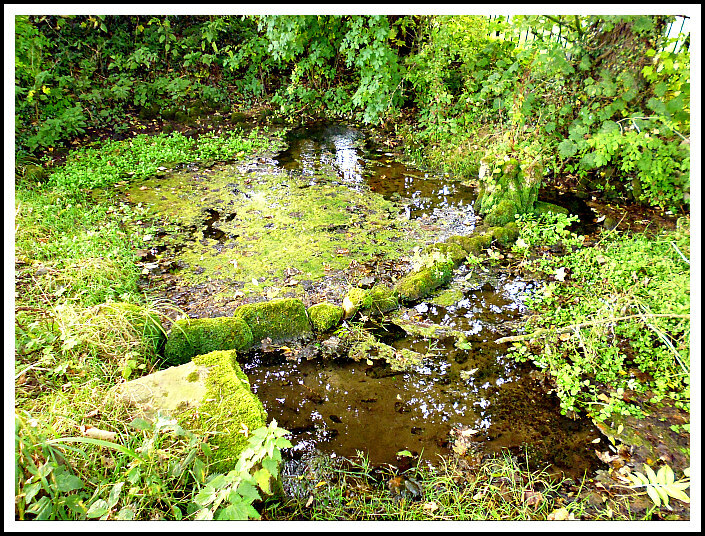 St Helen’s holy well stands in a walled and railed-off enclosure beside Eshton Lane, tucked in between the water-works and a wooded area, about halfway between Gargrave and Rylstone – in what is the district of Craven, north Yorkshire. Skipton lies a few miles to the east. The holy well has been a sacred site, not just since the late Roman period, but ‘long’ before that. However, almost certainly it had been ‘a sacred place’ in the so-called Dark Ages when the well/spring was dedicated to St Helen, the wife of Constantius Chlorus and mother of the first Christian emperor of the Roman Empire Constantine the Great, who was converted to Christianity in 312 AD. St Helen, also known as Helena, died in 330 AD; she was much honoured in the west where her feast-day was celebrated on 18th August. A number of churches and holy wells were dedicated to her in the north of England and a few in the south and south-west of England. 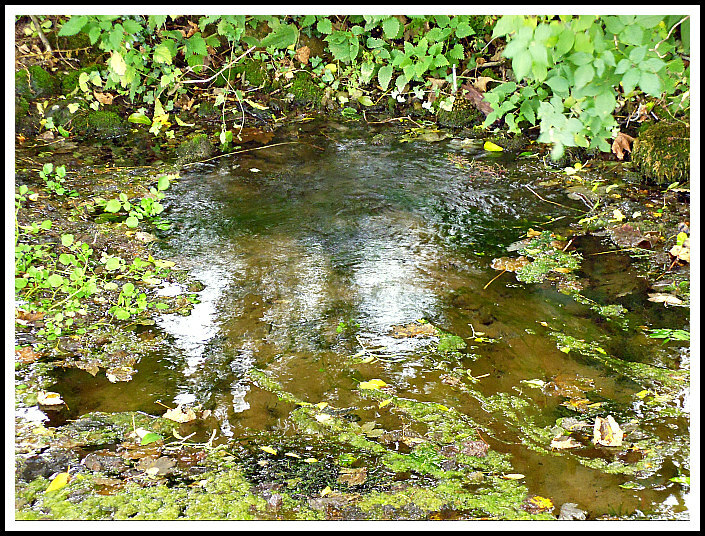 St Helen’s Well at Eshton. In the Anglo-Saxon age and later the Medieval period it became a place of pilgrimage and healing; the water of the well having the miraculous ability to cure diseases and ailments of the body.Today the well is still ‘a sight to behold’ with the water gushing forth (often with gusto) into the circular-shaped pool – although the carved stones that apparently lie in the pool are very often well below the mud and water-level! An ancient cross was found opposite the well in the 18th century, but then it went missing, though later pieces of this were deposited in St Andrew’s church at Gargrave. The authors John & Phillip Dixon in ‘Journeys Through Brigantia’ (Volume One), say that: “The practice of regarding water, and in particular a well, as having sacred and healing qualities is well attested among the Celtic peoples. Holy wells have their origins in the pre-English period and many occur on a number of Roman sites in West and North Yorkshire. With the coming of Christianity the pagan deities to whom the wells were dedicated were converted and replaced by a Christian saint — St Helen was especially popular in those early times. “St Helen was the mother of Constantine the Great and said to be of Northern British origin, an ancestor of Coel Hen Godebog — the post-Roman overlord of Northern Britain who came down in legend as ‘Old King Cole’. After her conversion to Christianity she made an energetic and devout pilgrimage to Jerusalem, and founded several churches in Palestine. “Her popularity began to crystallize about seventy years after her death after the story went round that she was privileged to discover the cross of Christ on the site of the Passion. She is usually depicted wearing a crown and holding a long T-cross” (John & Phillip Dixon, 1990). It was Geoffrey of Monmouth who ‘claimed’ that St Helena was a British princess and of the family of Old King Cole, but she was, according to David Farmer in his work ‘Oxford Dictionary of Saints’, born at Drepanum (Helenopolis) in Bithynia. Maybe Geoffrey had genuinely mistaken Bithynia for Britain, or that he hoped and wanted her to originate from Britain! Her son Constantine the Great did, however, have strong associations with Britain, particularly the city of York, known as Eboracum to the Romans. St Helen’s Well at Eshton in North Yorkshire. 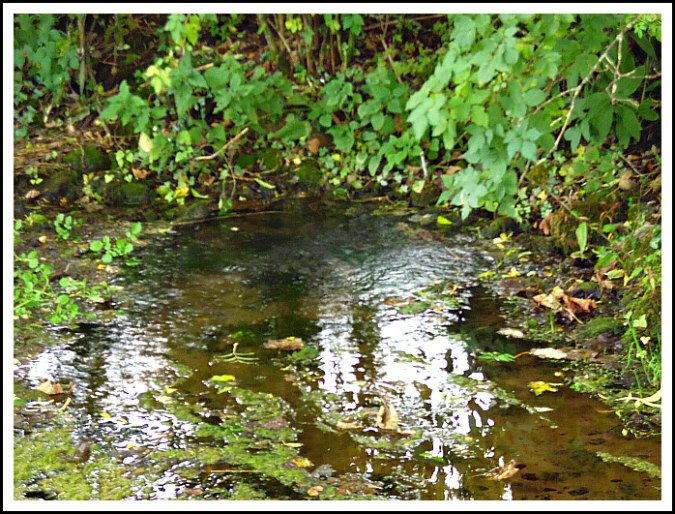 The water issues from a hole low down in the bank below the railings and flows into a circular shaped pool. At the front and sides of this pool (in a curved formation) there are a number of shaped stones that make up the outer perimeter of the sacred pool. Just in front of the point of entry for the water coming in there are ‘said’ to be two carved stones that resemble Celtic stone heads, but these are often covered by thick mud – and therefore not often visible – unless you feel around for them with your hands! The water goes out into a more modern drain at the side of the wall entrance. In the past devout people used to hang coloured rags on the branches of a tree, though this seems to have ceased now. There are records of a chapel existing in Chapel Field, close to the holy well but this has gone. In the 18th century an Anglo-Saxon cross was discovered opposite the well (John & Phillip Dixon, 1990), but this then to disappeared. It’s thought the carved stones in St Andrew’s church, Gargrave, are from “this” site opposite St Helen’s Well. According to John & Phillip Dixon the cross was very similar to the ones in Whalley churchyard, dating probably from the 11th century. Dixon, John & Phillip., Journeys Through Brigantia (Volume One) Walks in Craven, Airedale and Wharfedale, Aussteiger Publications, Barnoldswick, 1990. Farmer, David., Oxford Dictionary Of Saints, Oxford University Press, 2003. Categories: Ancient Crosses, Holy Well | Tags: St Helen, St Helen's Well at Eshton in North Yorkshire | Permalink.